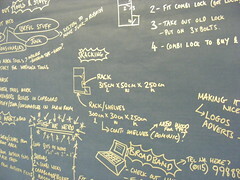 Every Wednesday the Hackspace will be open for drop-in hacking, to members and non-members alike. If you want to check the space out or talk to us about becoming a member, Wednesday nights are the best time. As well as occasional workshops, there’s always a few hackers working on stuff and chatting. You can choose to do your own thing, just hang out or join in if we’ve a planned activity or workshop. Bring your own tools and projects or use some of the growing selection of Hackspace shared tools. Literally almost anything is suitable for working on at the Hackspace including robotics, electronics, programming, knitting, crafts, woodwork, and even bike repair. You can bring any project to the Hackspace you like as long as it’s (fairly) safe and doesn’t disturb others… but if you are unsure contact one of the organisers for guidance.